High output LED AR111 lamp with narrow beam and anti-glare design. 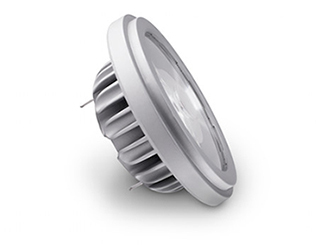 8° and 9° lamps can be modified with Snap System light shaping and colour adjustment lenses. May be used with enclosed and fixtures with front glass cover. 6W (for 4°, 12.5W and 18.5W power options. Dimmable with suitable power supplies.